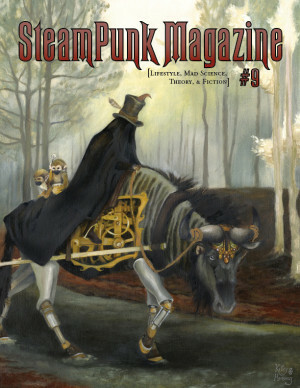 After a lengthy struggle and much holding of heads, we are delighted to finally be able to announce the release of Issue #6 of Steampunk Magazine – The Pre-Industrial Revolution. The cover has been beautifully illustrated by the wonderful Molly Crabapple, and the magazine has (among other things): the final part of John Reppion’s ‘Doppler and the Madness Engine’; a look at the Romantics and what they did for us; alchemy; Luddites; corsets; sculpture; windmills; poetry; and Victorian martial arts. It’s our biggest issue to date! As ever, Issue #6 can be downloaded from our website, or alternatively you can get your hands on your very own hard-copy through the order page on Strangers in a Tangled Wilderness. Stay tuned for news about ordering your very own copy of Steampunk Magazine from our new UK printing operation, the website, Lincoln Steampunk Convivial, and the exciting things that will be happening over the next few months! I suddenly can’t order to Slovenia anymore, what gives? I’m getting Slovenia coming up as an option just fine. Maybe try retrying it? If you continue having the same problem, let me know and I’ll see if I can get to the bottom of it for you! Why can’t I order the magazines from germany? I think the problem you’re having is with the ‘Ship to (Optional)’ section on the page you get immediately after adding the magaizne to your cart. If you just ignore it (leave it set to the US) and click ‘Proceed to Checkout’ then you can sign in and add your address, wherever you may be in the world. I have no idea why they give Denmark as an option on that front page, but not Germany.